Sony has confirmed that it is now concentrating its development efforts on DSLT cameras, which use a fixed translucent mirror, instead of the traditional DSLRs in its range. Speaking to TechRadar, Paul Genge from Sony UK said, "We made a clear statement during IFA, our president made a statement that we were going to be looking at full-frame as the next introduction for SLT." At the moment, Sony's current SLT line-up includes the Sony Alpha a77 and Sony Alpha a65, which were introduced last year. From the outside, DSLTs look almost indistinguishable from their DSLR counterparts. However, inside you'll find Translucent Mirror Technology that allows around 70% of the light entering the lens to pass directly through it and onto the imaging sensor, while a smaller amount is reflected up to the camera's phase detection autofocus sensor. This means that in practice, the time taken to record a shot is reduced, as well as allowing for full-time phase detection AF. Currently, Sony only manufactures APS-C size DSLT cameras, so the confirmation that the next full-frame camera from the company will be fixed mirror is exciting. 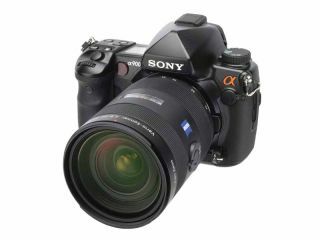 The last full-frame camera from Sony, the Alpha 900, was introduced in 2008. It has long been rumoured that a Sony Alpha a950 would stick with a traditional DSLR design, but Genge's comments suggest otherwise. When asked if SLT technology spelled the end of DSLR production for Sony, Genge said, "We have no SLRs in our line-up today, and our intention is to develop the SLT technology and make that a real stand-out in the market." It seems that Sony has discontinued all of its existing traditional SLR cameras, and will only be working on bringing new style SLTs to the market. Of course, it's not known exactly when a new camera will be introduced, but we'll keep you updated as and when we know more.